How to pick the right student accommodation - Which? Wherever you choose to live will have a big impact on your wallet. The Accommodation Costs Survey 2018 – conducted by Unipol and the National Union of Students (NUS) – found that the average rental bill took up 73% of the maximum student loan. Plus, making the wrong housing decision can put a damper on your uni experience (or for however long your contract is). Most first year students are allocated a place in university-managed accommodation or ‘halls’, which certainly has its advantages. In terms of making friends, living with other students is a great way to get to know people you may end up becoming good friends with (and even living with next year). Note, some university-managed halls might not be on campus, but located in the local city or town instead. You’re also conveniently located, so you don't have to worry about commuting in daily for lectures, group work or to use the library (as well as for the more fun stuff like societies, clubs and activities put on by your student union). If you’re going to be living away from home for the first time, halls can also be good preparation for living in the private-rented sector as you have many of the benefits of independence, but without needing to think about the complications of utility bills or landlords. You’re also likely to be well supported by the housing office or university itself if anything goes wrong. You're not alone: extra support will be available from your university if you need it. Living near to lots of students: get used to putting up with noise and mess! 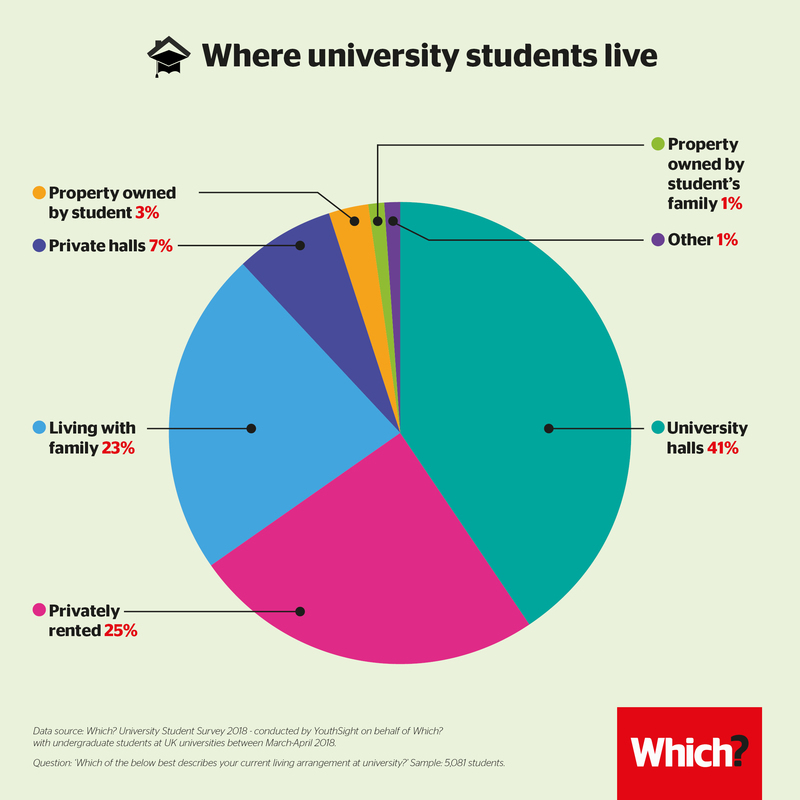 A second option in some areas is to go for a room in a purpose-built student living complex, an option that is growing in popularity; Unipol and the NUS found that private halls made up half of student bed spaces in the UK. The set-up is similar to halls managed by universities – you have your own room and you share communal areas like a kitchen or TV room – but it's owned by a private company. Studio apartments may be available too (though these are usually pricier). Private hall providers are quite common in big cities like London or Manchester, which have several universities based there (and thus lots of students looking for a place to live). If you’re considering this option, make sure you do some research into what you'll be getting for your money ie bills that are included (including any upfront costs you'll need to account for) and facilities on site. Private halls can be a great way to expand your social circles, as you may find students from other universities in the same building. When browsing providers, check what communal spaces are available plus any regular activities or events for residents to meet and socialise. Your university will have an approved list of private accommodation providers, and may even have a more formal partnership in place with one already (especially if they don't have enough places in their own halls to meet demand). Location, location: you'll be close to all the student action (not necessarily limited to just your university). Same student pitfalls apply: noise, not choosing who you live with, mess and so on. Learn more about housing at your university. Search for a university profile for key stats and info in one place. Others may prefer not to live in halls of any kind and move straight into the private rented sector, where you rent a house or flat with a group from a landlord or letting agent. Sometimes it'll be your choice – if you're a mature student who wants their own living space outside the realms of university, for instance. Other times, it might not be – not all universities are able to guarantee a place in halls of residence for all first-year students (it's a good question to ask at an open day) – so you could be among those who miss out, especially if you've come through Clearing or are late with your application. Don't have a place in halls? Check our advice for finding housemates if you're a first year student. Living in a privately rented property can be appealing as it enables you to decide exactly where you live and who with. While it can be tricky to find those in a similar position and organise viewings if you haven't moved to university yet, your housing office can assist you with this eg matching you up with others, recommending approved lists of landlords or student-friendly letting agents etc. Most students move into privately rented accommodation after first year anyway (while it's also further preparation for post-uni life). Flexibility: the private rental market is packed with different living options to suit you. Dealing with admin: you'll be dealing direct with a landlord or letting agent . Living at home works well for many students as it can significantly cut your costs (and is the one option that doesn’t involve packing up all your worldly goods and relocating). This could make all the difference depending on how much you receive in student finance and your overall budget. Not sure how much you'll need to live on? Try our student budget calculator to help work out living costs for your uni. You might be concerned that this will have an impact on your ability to meet other students; but while it might require a little more effort and planning, you’re sure to meet plenty of people, both in and out of your lectures. Sports clubs, societies and students’ union events are a great place to start. The old cliché: someone else taking care of cooking, cleaning, laundry...? Cheap: should save you money overall. Someone else's roof: that means someone else's rules.